Modifiers are used to add variations and flexibility to your product offering without creating an excessively large menu. You are able to create modifiers manually or en masse using Excel. 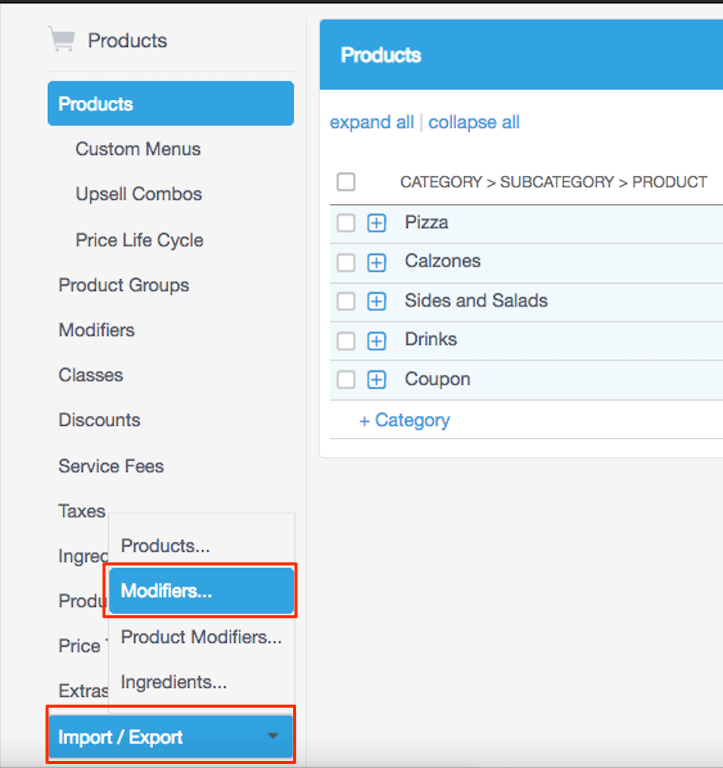 This article will walk through the process of adding and editing your modifiers using the Import/Export feature. Please Note: Import/Export is only possible with Excel. Basic: This spreadsheet contains the minimum level of modifier details like name, price, cost, and active status. The basic export will contain your existing modifiers. You can edit your existing modifiers or add new modifiers with this spreadsheet. Next, select if you want to Export Active Items Only. Then, choose an option for Auto Field. This means that any modifier created previously on the Management Console will be assigned a Barcode or SKU. If your modifiers need to have a specific barcode and/or SKU assigned, you can do that via the spreadsheet. Lines 1-19 in the spreadsheet provide instructions on how to use the sheet. You can leave them there or delete them, but no action is required for those lines. Modifier Class Name: Column A; This is the grouping that your specific modifiers will fall under. For example, Cheese Types, Size, and Dressing Choice could all be modifier classes. Modifier Name: Column B; This is the name of the specific modifier. For example, Pepper Jack, Medium, and Ranch. Description: Column C; Here you can provide more details about the specific modifier. The modifier description is accessible on the Point of Sale. This is an optional field. Price: Column D; The amount the customer will be charged upon purchase of the modifier. The price can be left at 0 if it is a free modifier. Cost: Column E; The amount it cost your business to purchase one single unit of this modifier. SKU: Column F; If the modifier has a specific Stock Keeping Unit associated with it, put that here. Barcode: Column G; If the modifier has a specific barcode associated with it, put that here. Please Note: Modifiers MUST have a barcode or a SKU. If your modifier does not need a specific SKU or barcode, it can be an arbitrary number. Active: Column H; If the active status is Yes, the modifier will be available for use on the Point of Sale. If the status is No, it will not appear on the Point of Sale but can still be accessed on the Management Console. In order to successfully upload your modifier spreadsheet, the Modifier Class Name, Modifier Name, Price, Cost, SKU OR Barcode, and Active fields MUST be filled out. All other fields are optional. Click the Import/ Export button and choose Modifiers. You will be back on the same screen from which you exported the list. Scroll down to the Import Modifiers section. Click Choose File and attach your spreadsheet. The upload process occurs offline. You will receive an email with the results of the import. If the email states any errors occurred, fix the issue in the spreadsheet and upload it again.